Brassica nigra (black mustard) Kali Mohari, is an annual weedy plant cultivated for its seeds, which are commonly used as a spice. The plant is believed to be native to the southern Mediterranean region of Europe and possibly South Asia where it has been cultivated for thousands of years. The spice is generally made from ground seeds of the plant, with the seed coats removed. The small (1 mm) seeds are hard and vary in color from dark brown to black. They are flavorful, although they have almost no aroma. The seeds are commonly used in Indian cuisine, for example in curry, where it is known as rai. The seeds are usually thrown into hot oil or ghee, after which they pop, releasing a characteristic nutty flavor. The seeds have a significant amount of fatty oil. This oil is used often as cooking oil in India. Ground seeds of the plant mixed with honey are widely used in eastern Europe as cough suppressant. In Eastern Canada, the use of mouche de moutarde to treat respiratory infections was popular before the advent of modern medicine. It consisted in mixing ground mustard seeds with flour and water, and creating a cataplasm with the paste. This cataplasm was put on the chest or the back and left until the person felt a stinging sensation. The plant itself can grow from two to eight feet tall, with racemes of small yellow flowers. These flowers are usually up to 1/3" across, with four petals each. The leaves are covered in small hairs; they can wilt on hot days, but recover at night. 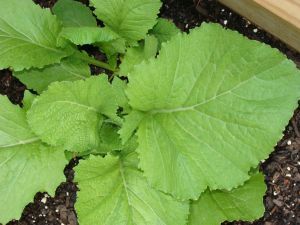 Recipes Using Black Mustard Greens.